Oregon vs Sam Houston State – College Station, TX 12:30 p.m.
Oregon vs Texas A&M – College Station, TX 2:30 p.m. The No. 2 ranked Ducks continue their trek through the Lone Star State with a game against the No. 23 Texas A&M Aggies. 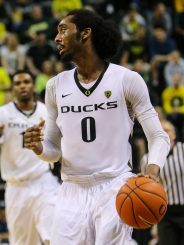 2/18/15 Men’s Basketball — Oregon vs Colorado — Matt Knight Arena 8 p.m. The Ducks return to Eugene after splitting games with the L.A. schools last weekend. The loss against UCLA left Oregon in a third place tie in the Pac-12 with the Bruins. 2/19/15 Women’s Softball – Baylor – Waco, TX. 4:30 p.m.
Oregon continues its Texas road trip with a tilt against the No. 9 ranked Baylor Bears in the opening game of the Baylor Invitational. Baylor along with Oregon made the final four of the WCWS last year. 2/19/15 Men’s Baseball – New Mexico State – PK Park 6 p.m.
On Valentines Day, Nick Catalano hit the first home run of his career as the Ducks came from behind to beat Hawaii on the road. Sorry Rainbows, no flowers or candy for you. 2/20/15 Women’s Tennis – UCSB – Santa Barbara, CA 1 p.m.
2/20/15 Men’s Tennis – Nebraska – Student Tennis Center, Eugene 5p.m. 2/20/15 Men’s Baseball – New Mexico State – PK Park 6 p.m.
2/20/15 Women’s Basketball – Utah – Salt Lake City 6 p.m. The Ducks have bought into Kelly Graves‘ defensive-oriented game plan and won four out of their last five games . They now sit in a seventh place tie in the Pac-12. A post-season tournament is still within reach. North Texas – Waco, TX – 7:30 a.m.
Baylor – Waco, TX – 2:15 p.m.
2/21/15 Women’s Tennis – Santa Clara – Santa Barbara, CA 10 a.m.
2/21/15 Men’s Baseball – New Mexico State – PK Park 2 p.m.
2/21/.15 Acrobatics and Tumbling – Concordia (Wisconsin) Matt Knight Arena 6:30 p.m.
Last weekend the Ducks beat Azusa Pacific to earn coach Chelsea Shaw her first win as the Oregon head coach. 2/22/15 Men’s Tennis – Santa Clara – Student Tennis Center, Eugene 11 a.m.
2/22/15 Women’s Basketball – Colorado – Boulder, CO 1 p.m.
2/24/15 Men’s Baseball – University of Portland – PK Park 6 p.m.